We all need a break from time to time. 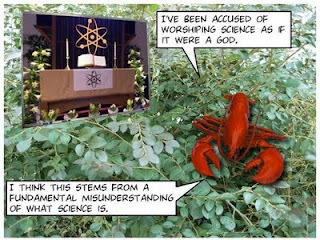 Where can you turn for a bit of lighter side of science online? 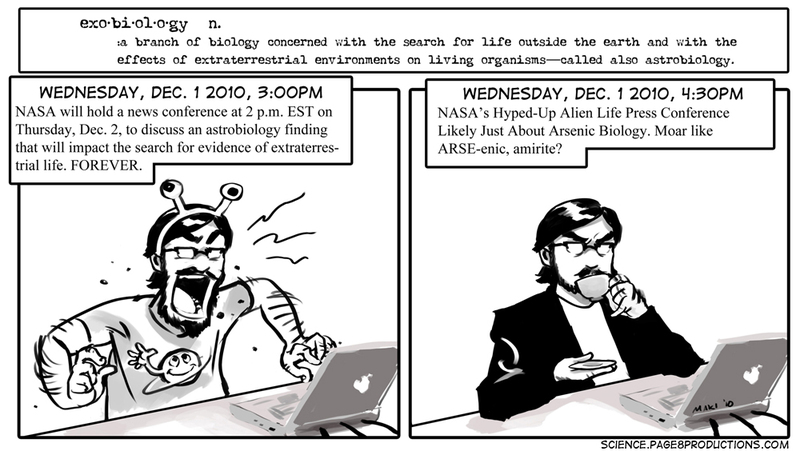 It’s elemental: Here’s a look at some of the best, totally nerdy, science-oriented online comics. Listed in no particular order, this is only a sampling of the phenomenal work being posted online. Xkcd: A Webcomic of Romance, Sarcasm, Math and Language by Randall Munroe, is probably the most widely known. A cast of stick figures addresses topics ranging from science research to philosophy to relationships and the absurdity of daily life. The illustration to the left mocks Frank Drake’s infamous Drake Equation, which attempts to calculate the number of ‘intelligent’ extraterrestrial civilizations in the Milky Way Galaxy. 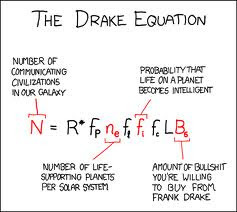 I’ve spent quite a bit of time dissecting Drake equation... but that’s another topic. 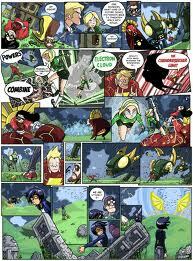 Strange Quark Comics by Dalin S. Durfee, featuring Dr. Ingenio, his nerdly son and assorted nerdy grad students. 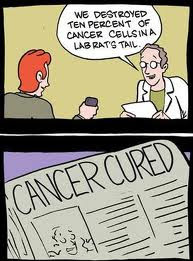 An insightful look at the everyday quandaries of life in the laboratory, from someone who’s obviously been there. Saturday Morning Breakfast Cereal by Zach Weiner Sometimes about science and research, but more generally about God, superheroes, dating, the meaning of life…and much more. The cartoon to the left questions how nuggets of scientific research are translated into the media frenzy of the real world. I’ve gotten many a laugh out of the unexpected punch lines and spot-on insight from Saturday Morning Breakfast Cereal. 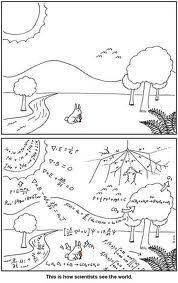 Abstruse Goose: a cartoon about math, science and geek culture. One of my favorites is: How Scientists see the world, shown to the left. Does an understanding of the equations underlying light make a sunset less beautiful? Or, did Newton “unweave the rainbow” by reducing it to a prism, as Keats contended? The tools of science, from the first microscope to the Hubble and Spitzer telescopes have so vastly expanded our ability to perceive the universe in all its breathtaking beauty. Nostalgic simplicity junkies preach that esthetics should be devoid of either curiosity or understanding. Might as well say that it isn’t for human beings. Girl Genius, offers the marvels of gorgeously detailed steampunk technology, set in an alternate-history where mad scientists rule the world. It follows the adventures of the flamboyant and brilliant girl genius, Agatha Heterodyne, in the city of Mechanicsburg. 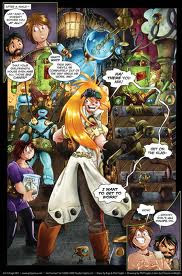 This beautifully drawn comic, by Phil and Kajo Foglio, has twice won the Hugo Award for Best Graphic Story. Schlock Mercenary, The Comic Space Opera, by Howard Taylor This science fiction strip, nominated twice for a Hugo Award for Best Graphic Story, is set in a distant future that has achieved faster-than-light travel and artificial intelligence, and made contact with aliens. It follows a band of space-faring mercenaries as they travel through wormgates, loosely following a handbook of rules, “The Seventy Maxims of Maximally Effective Mercenaries.” A vivid exploration of far-out futuristic technologies and their implications for humanity. Scenes from a Multiverse: A colorful (in more ways than one) comic about life in an ordinary Multiverse, by Jonathan Rosenberg. 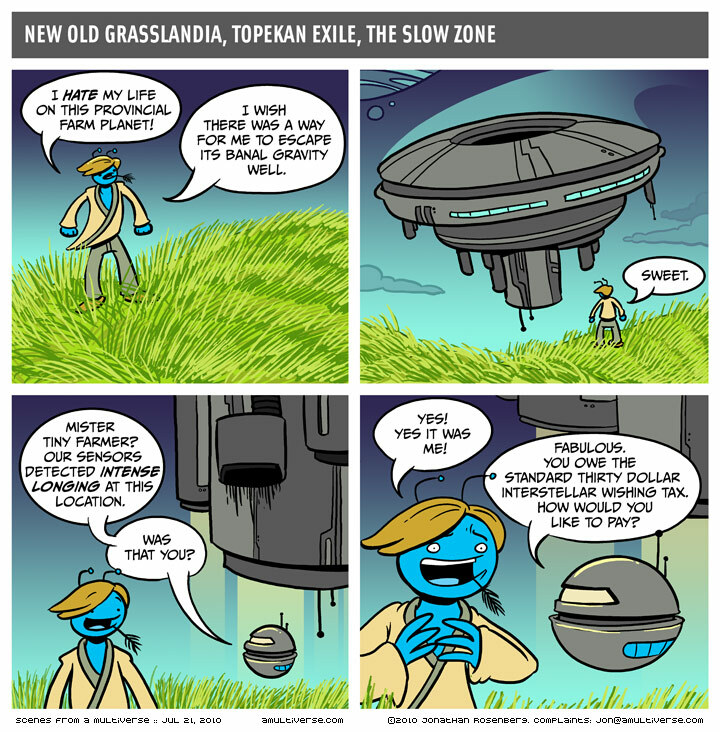 One recent strip, set in the “Psychcloaked debris belt of the Third Foundation,” depicts an alien who claims, “Using my brand-new science of neurofuturism, I can predict overall historical trends of the multiverse for the next ten thousand years!” He describes a series of disasters, finishing with, “After that it’s mostly apocalypses and bank holidays. Not very interesting.” Har! But this is only the tip of Farley’s iceberg. He is an amazing artist and the one taking on the deepest issues. His “Spiders” online graphic novel has been seriously studied at the Pentagon, to try and understand how citizens might get involved in defense, if we enter a transparent society. I was just referred to Sci-ənce! 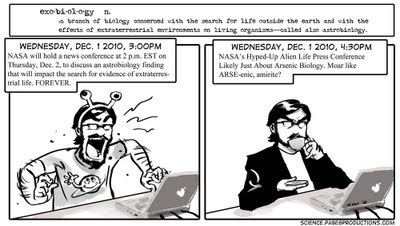 A wonderful new webcomic (with insightful commentary) that addresses the difference between science and pseudoscience, with a constant reminder to bring a sense of skepticism to our search for knowledge, The sample shown here mocks the between the build-up and the reality of the big NASA press conference about “microbial extraterrestrial” life. By Naki Naro and Nadir Balan. 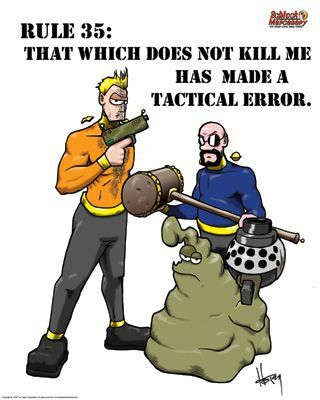 And Dresden Codak is an award-winning science fictional webcomic written and illustrated by Aaron Diaz, who describes it as a “celebration of science, death and human folly.” Its highly intellectual humor, not for the faint of heart, ranges from physics to philosophy. A beautifully imagined vision that deals with the results of a technological singularity and humanity’s role in the cosmos. So, which of these (or others) do you like best? I don’t usually do polls. But let’s take a vote! Have a laugh or two, or many — and follow some of these talented (and under-appreciated) artists. Narbonic has even madder science than Girlgenius. “Project skin horse” is a spinnoff of Narbonic about the government agency taking care of uplifted animals. 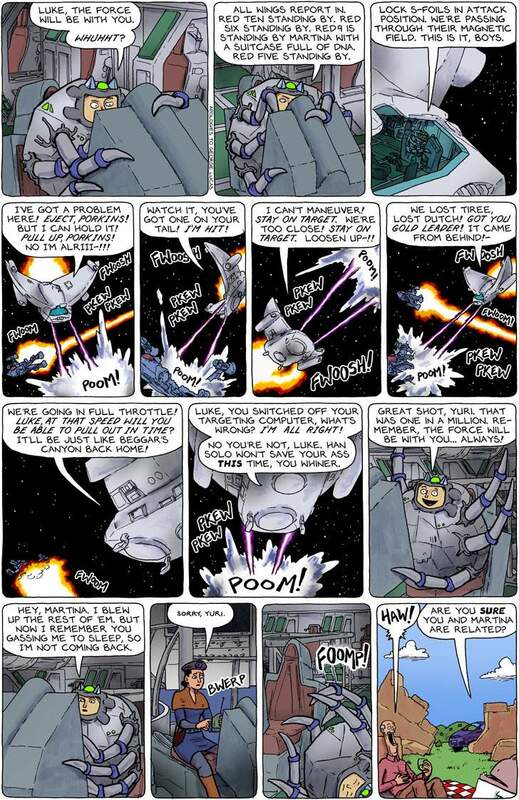 nukees is also a nice research/sci-fi comic. City of Reality has some nice play with genre conventions. Yes, Narbonic and Nukees are wicked good.